I've been trying to circumvent "the system" these days and I figured out a way to keep my unlimited data on my Verizon phone. I want the new Samsung Galaxy S4 when it's released, but if I use my current line to upgrade, I lose my unlimited data plan. After snooping on the internet, I realized I can add a new line with the new Samsung. When the phone arrives, I need to activate it on my current line instead of the new line, and then activate a old non-data phone on the new line. That works perfectly for me because we don't have a landline at home. So double win for me, a new landline for the house and new Samsung Galaxy S4 for me without losing my unlimited data plan! Now if only I can keep the new phone out of LO's mouth! Another lost-but-now-found polish, this is Emily de Molly's Harmony for you tonight. 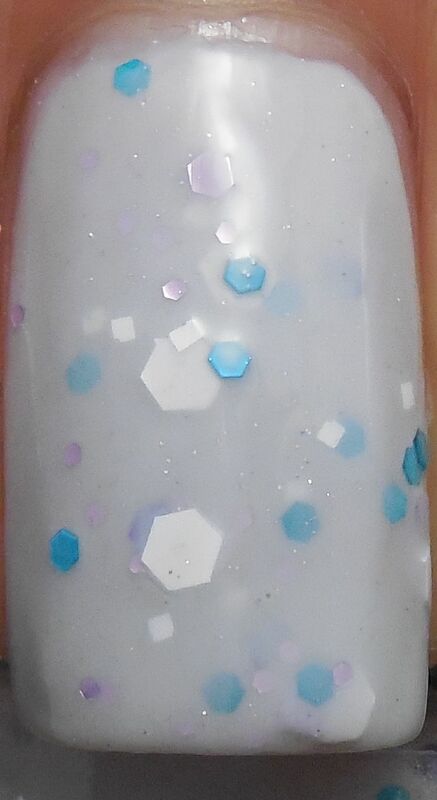 This is a light lavender cream base with multisized hex glitters in dark purple, teal blue and matte white. I had no issues with application and it had the standard indie glitter consistency in formula. I used three coats here with Essence Gel Look Topcoat to finish. I wish Emily De Molly polishes were easier to get here in the states rather though third party sellers, but it's still worth the extra hassle and money. I found this to be a nice palette cleanser after using several dark polishes lately, not to mention I can never get enough matte white glitter. What's your favorite type of glitter? This is really pretty! I have yet to try her polishes but they all look nice. thank you! she's one of my favorite indie makers.